It’s hard to see the detail in the small image shown here; click on it to enlarge it on your screen. . .
Once the gel medium and paper clay had dried, I painted the page with black acrylic paint. 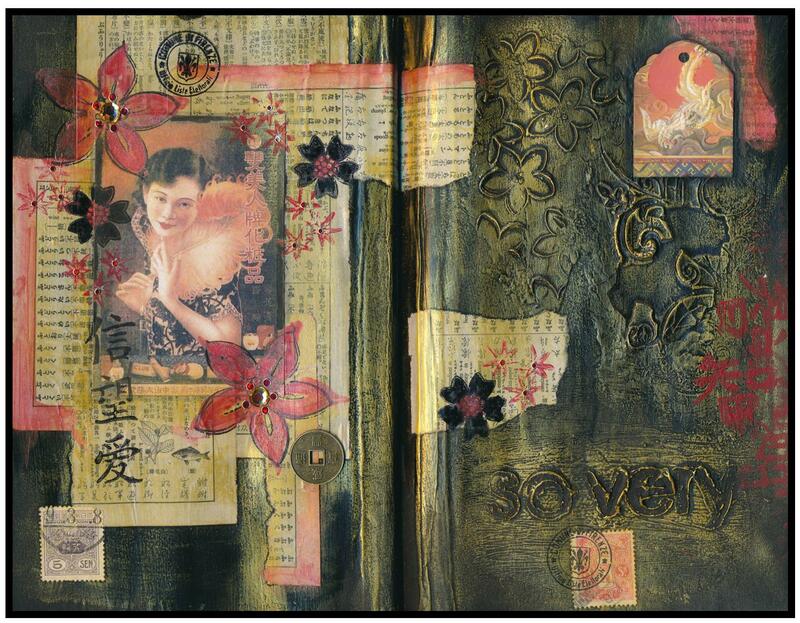 I collaged some Asian book pages, images, and postage stamps onto the page, and then rubbed gold-coloured InkaGold onto the entire page to accentuate the texture. I rubberstamped floral images and Asian writing using Archival Ink and acrylic paint, and applied watered-down InkaGold (red!) to paint the petals of the large flowers on the left. If you click on the picture to enlarge it, you will be able to see the tiny bling I adhered to the center of the flowers. Rubber stamps can be used for so much more than just stamping ink! As this art journal page shows, I used rubber stamps to create an incredibly textural surface that looks like aged metal. I look forward to sharing these techniques (and others) on January 23rd!